The American Society of News Editors released its annual newsroom census figures today showing a severe decline in the size of newspaper staffs. The losses are also more than twice the level estimated in March by Rick Edmonds, coauthor of the chapter on newspapers in the Pew Research Center’s State of the News Media report. Edmonds discussed the losses in a piece published earlier today on the Poynter Institute’s website. Although the decreases announced by ASNE today are substantial, Edmonds points out some caveats about the data. Several large newspapers did not fill out the survey this year, resulting in missing data from some major outlets. These papers include USA Today, the Los Angeles Times, the Baltimore Sun, the Arizona Republic, the Miami Herald, the (New Orleans) Times-Picayune and several others, according to Edmonds. In all, 978 of 1,382 dailies responded to the survey. Additionally, the definition of editorial staff has become muddled. Several newspapers with regional editing centers (where employees edit and publish reports covering a wide area) were allowed to determine whether including their share of those groups would count as part of the news staff or not. This means the count was inconsistent among newspapers. 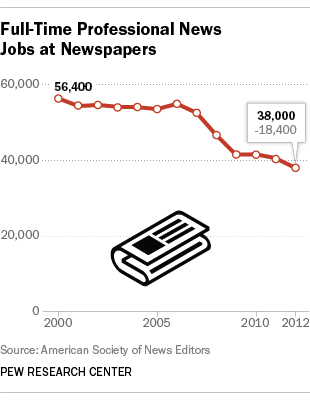 The decreases reported by ASNE reflect cuts seen at several major newspapers in the past year. Most recently, the Oregonian announced it was cutting 45 newsroom staff earlier this week and the Chicago Sun-Times let its entire 28-person photo staff go in May. The diminished capacity to gather news, and its impact, was noted in the State of the News Media report which found that 31% of those surveyed said they had deserted a particular news outlet –not just newspapers — because it no longer provided the news and information they had grown accustomed to. One question often raised is how new news outlets, particularly at the local level, are stepping in to the fill gaps left in the cutbacks at traditional newsrooms. The Pew Research Center’s recent report on nonprofit news outlets found that 172 digital nonprofit news outlets had launched since 1987, but many of these are small with minimal staff and modest budgets — 78% of nonprofit outlets surveyed reported having five or fewer full-time paid staffers-including business and administrative roles.